Civilians have been evacuated from the last village in Syria still held by the Islamic State (IS) group. A convoy on Wednesday carried hundreds of men, women and children from Baghuz, near the Iraqi border. The US-backed Syrian Democratic Forces (SDF) alliance have said they are waiting for their removal before launching an offensive against militants “entrenched inside”. The SDF say it cannot confirm if any militants were among the passengers. Those removed will be taken to a screening point, according to SDF spokesman Mustafa Bali. There have been conflicting reports on how close the SDF is to ridding the enclave of IS fighters. 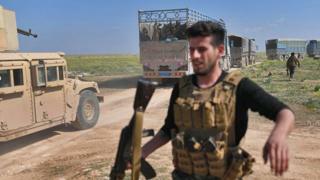 The US-led coalition fighting IS has said the “most hardened” fighters remain within Baghuz. The SDF has said the group are waiting for confirmation all civilians are out before storming Baghuz to target the fighters. “Our forces said from the start that they have two options: unconditional surrender or for the battle to continue until its end,” Mr Bali, told the Reuters news agency. 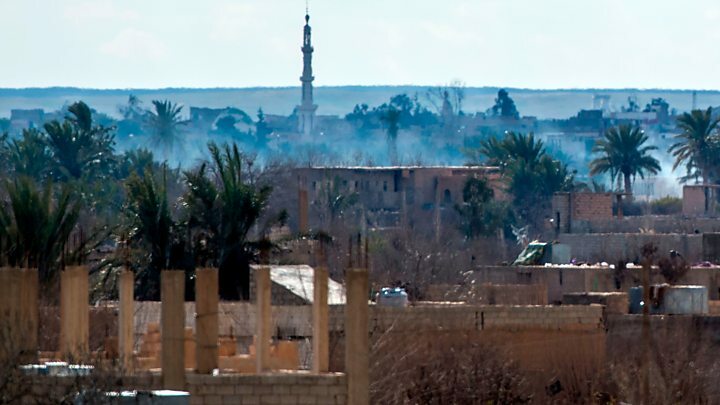 But one monitoring group suggested that the remaining militants could have all left the enclave after negotiations with the SDF. As many as 2,000 people may have left the enclave on Wednesday – one day after a convoy of about 50 lorries arrived on its outskirts to get them out, Reuters reports. The vehicles were brought in after the UN expressed concern about the fate of some 200 families reportedly trapped in the area. At least 15 of the vehicles were witnessed leaving by journalists near the scene on Wednesday. As night fell on Baghuz , it was not clear how many people still remain inside. Some 20,000 civilians who have fled the area in recent weeks have been taken by the SDF to a makeshift camp for displaced people at al-Hol, in Hassakeh province. ← Brit Awards 2019: What's Hugh Jackman doing there?